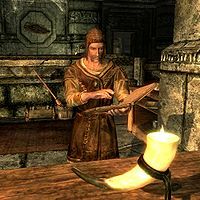 Imedhnain is a Breton food vendor living in Markarth. He works at Arnleif and Sons Trading Company and will take over the shop if Lisbet dies. He sleeps in the northwestern bedroom every night between midnight and 8am. The rest of his day is spent doing his job in the main trading room, either wandering, sweeping, eating, or relaxing in a chair. If he takes over the store, he will take the spot behind the counter every day between 8am and 8pm, then spend the evenings strolling around. He wears a belted tunic with a pair of boots and a hat. He carries an iron dagger, his key, and a selection of lower-class items and gold. When you enter the store the first time, Imedhnain will be engaged in a brief conversation with Lisbet, both of them referring to the Forsworn attack outside. Imedhnain will ask: "Did you hear all that noise outside?" Lisbet will then brush him off and instead talk to you: "It's just the market rabble. We should get back to work. You there. If you're here to trade, step up to the counter." When you approach Imedhnain he will point you towards Lisbet, saying: "Lisbet handles the customers. I just check the shipments." He will also say: "Feel free to take a look around the store. ", "I've been at Arnleif and Sons all my life. It's a good store. ", "I remember old Arnleif building each shelf in this store himself. ", "Old Arnleif would be proud of Lisbet. She's kept this place running, thick and thin." Lastly, he will reveal he is related to local drunk Cosnach: "I brought in my cousin Cosnach to help me handle shipments." If Lisbet is dead, upon entering the shop Imedhnain will say: "With Lisbet gone I will be taking care of you." When spoken to again, he may also say: "Let me know if there's something you need to buy. ", "I'm keeping Arnleif and Sons going as best I can." and "Never thought I'd be running the store. I'm not used to it." When you exit conversation he will say: "I better get back to sorting the dry goods." and "Now where did I put that shipment of forks..."
This page was last modified on 13 July 2013, at 20:58.